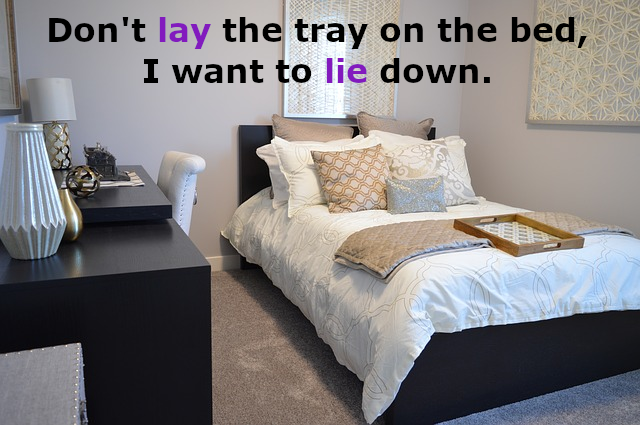 Don’t lay the tray on the bed, I want to lie down. The English verbs lay and lie are commonly confused by even native English speakers. I’m not lying when I say that you can now lay your fears of not knowing the difference to rest. Lay is a transitive verb, which means that it must be used with a direct object. Please lay the books on the table. I am laying the books on the table. Have you ever seen a chicken lay an egg? The chicken has been laying eggs all week. "Now I lay me down to sleep…"
The past tense and the past participle of lay are both laid. I laid the books on the table. Have you laid the books on the table? The chicken just laid two eggs. He laid himself down to sleep. Lie is an intransitive verb, which means it cannot have a direct object. Lie down next to me. I am lying next to her. I just want to lie in bed all day. I’m thinking about lying in bed all day. Don’t lie on the floor! The past tense of lie is lay and the past participle is lain. Yesterday, I lay down next to her. He has lain down with us. Yesterday, he lay in bed all day. I lay on the floor last week and you didn’t say anything. Lie (past tense lied) means to say something untrue. He lied about where he got the money. There are two problems here. One is that lie and lay mean more or less the same thing; it’s just that lie is intransitive and lay is transitive. In addition, the past tense of lie is identical to the present tense lay. Just remember that in the present, you lie down/on/in, but you lay something. Once you’ve got that straight in your head, you just need to work on the past tenses and you’ll be all set – no lie! Could you help clarify what to use in the following context? Lies, because there is no direct object. Ha, yes, but “lie” is the only correct answer because it’s intransitive. In the midst of a sprawling community lies Anyname Park. In the midst of a sprawling community lays Anyname Park. 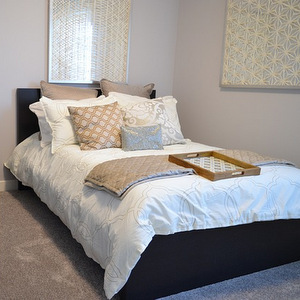 >>In the midst of a sprawling community lies Anyname Park. Is it lay because the apartment Is he direct object being referred to? No, it’s “lie.” Apartment is the subject of the verb lie, not the direct object.